marshmallow – tlc. | tender love and cupcakes. 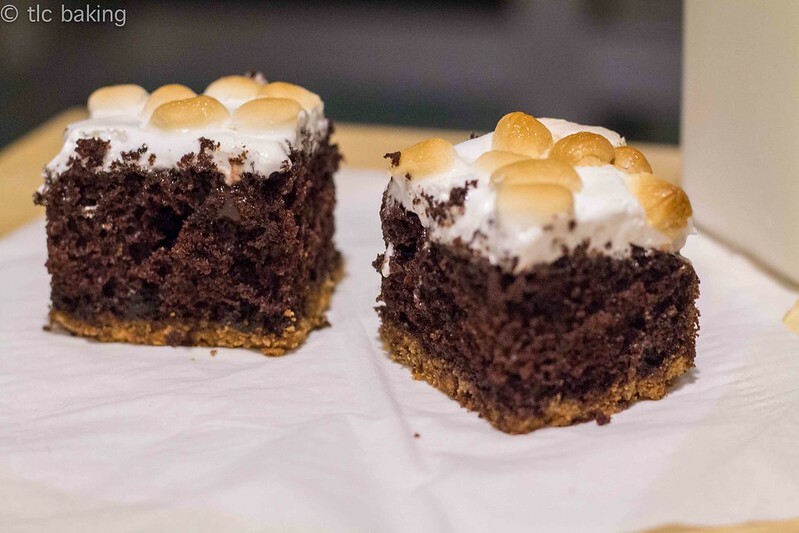 Last night, I was joined by the lovely Gabby Costa in my somewhat janky house kitchen, where we attempted to recreate these beautiful squares of marshmallow-and-graham-cracker-goodness. Let me tell you: it got messy. But I mean in the best of ways–the kind that includes fluff stuck to fingers and far more Aaron Carter than is probably acceptable anymore. And on the topic of fluff, can we address how terrifying the stuff is? It sticks to anything and everything except what it needs to, its shelf life is alarmingly long, and somehow, it is still delicious. Seriously, there’s something wrong with this picture. Nothing wrong with this picture, though. 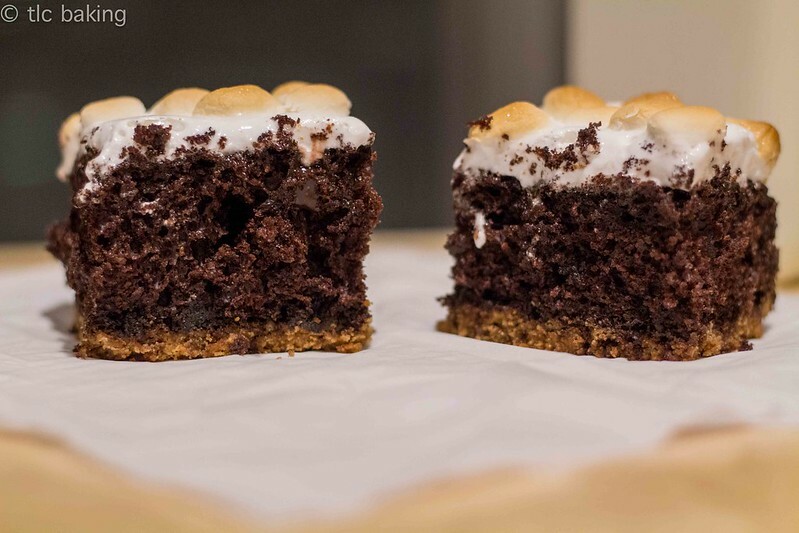 All those golden, perfectly toasted marshmallows topping a fudgy chocolate cake made even more gooey with smooth chocolate pudding. Oh yes. That’s quite the cake. So this particular recipe was actually chosen by Gabby. I was instantly sold when I saw that there was chocolate pudding involved. Spouts of pudding? Inside my cake? Yes, please! + Make big holes for your pudding! Either use a wooden spoon with a thicker handle, or just push the handle around to make the holes bigger. Otherwise, the pudding won’t actually fill your cake. + 3.4 ounces of instant pudding is a lot. Like a lot. Like way more than you actually need for this cake. And you know what else is a lot? 13 ounces of marshmallow fluff. 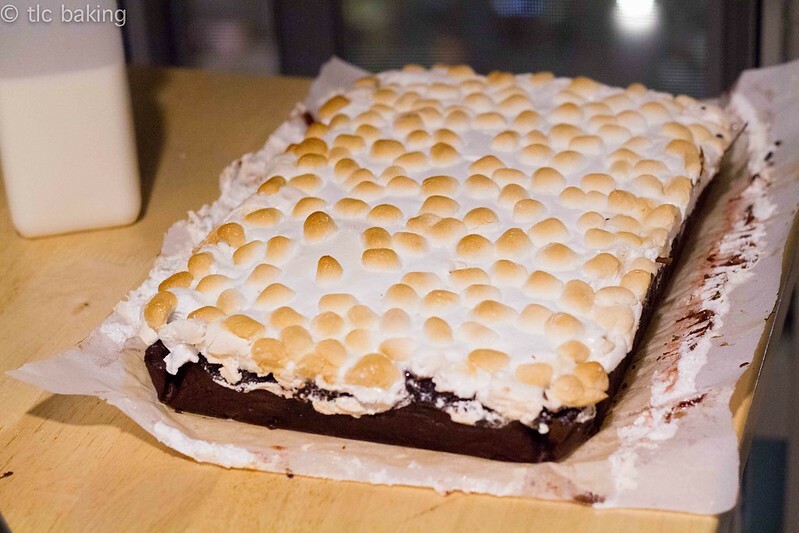 I ended up using just over one 7.5-oz jar of fluff, and if you look, it was enough to coat the 9×13 cake with a good, thick layer of marshmallow. Save yourself the trouble of dealing with 13 ounces of the monstrously sticky stuff, and just use less. Lucky for us, we were baking in a dorm, and we had no trouble getting rid of things like extra chocolate pudding and fluff. Other adjustments: I dropped the sugar from the graham cracker crust–the cake is sweet enough–and increased the baking time of the actual cake from 20 minutes to ~30, because mine was still jiggling after only 20. You want it to be just baked, so that it can still sit in the oven for a little while after the pudding and marshmallows are added. And in the meantime, enjoy the beautiful spring sunshine!